Remind me why I actually VOLUNTEER for more work again??? The felting session with my son's class was madness. Most of the kids ended up with a decent felted pumpkins, but time just ran out. I thought it would take two hours and I felted flat out for three and could have gone on another hour. I ended up having to felt the pieces with them 3/4 way done and putting them in a sealed bad and sending home to finish the job with their household washing. I do this to finish my pieces, but I just hope the kids remember to tell their parents when they get home (a lot don't) and the mothers don't open up their schoolbags and find this lump of wet felt and wonder what it is!! If they throw them in the machine they should all turn out fine after a little stretch and hot iron. However, the cupcakes were a hit and there were enough for all the kids and teachers. My camera is on it's last legs though, so I hope Santy wants to bring me a new digital camera for uploading. I am tired. I was fighting off a bug most of the week and work stress did not help much. I was informed that I don't have enough Irish to continue on my work scheme and wasn't sure if I had a job at all for awhile there. Turns out I WILL have a job, but they are transferring me to a job that does not require Irish. Details to be sorted out, but all going well it will be very interesting. The rain is running down the windows and the wind galing, so must tidy up the house and get ready to felt. It's an indoor day! It would seem that I have been living under a rock, but no, I am still here. Work and life have been interfering in my craft progress, dammit. I did get the two pieces felted below. I need to do embroidery and beading on them both and I will post them again when they are totally finished. The drama of the last week is that I will have my job for another year. I will make less progress felting, but I will have money to pay the bills, so there is some good and bad. For myself, the peace of paying bills seems to win out. 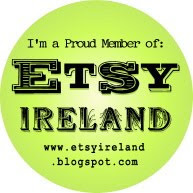 I am heading to Dublin October 29th for the Knit and Stitch Show in the RDS. Is anyone else going? It should be fab and I am looking forward to seeing the Swishing Tent. You take in three items and swap vintage or handmade clothing. Hopefully something fun will show up! There is a small fee paid and that will go to a children's charity. I am taking a class on Lutrador and other surface decoration products and a beaded broach class. This is my first time going to the biggest textile show in Europe, but there should be lots of suppliers exhibiting, individual artists, and craft classes. I need to get lots of beads and I will go to Yellow Brick Road in Dublin (www.yellowbrickroad.ie) and see what they have to add to my collection. I order some beads online but beads are a tactile thing and seeing them close up is so much nicer. It would be good if there are some fabric people there and I am hoping Fibrecrafts (www.fibrecrafts.com) is coming over, since this show toured England before it comes to Dublin. Anyway, let me know if any Kerry people are going so we can meet up. This Friday I may have taken on more than I can manage. I ordered merino and I am going into my son's classroom to felt pumpkins with them. All well and good, but there are 23 of them and I will be under pressure with time. I think I will have to do four at a time and get them done in twenty minutes and then start the next group. They are mostly age 7 and fairly enthusiastic, so we will hope for the best. And I am making Halloween cupcakes for them, too (will post pics), since they are getting their Mid-term Break holidays that day. I have all kinds of gummi eyes and scars and disgusting edible bits to put on top, so they should be a hit with kids and teachers. I have been trying to get at Autumn jobs. The grass is mowed, bulbs mostly planted, sidewalks swept up and tidied, fireplace cleaned, but I need to trim hedges still. With all the rain during the summer they have grown like mad and need a severe cut to keep them from bearing down on the house. And the dreaded weeding of flower beds. I seem to have so little time for gardening now with all the craft work I have been doing. I am not creating any more flower beds and I decided to plant monbretia along the hedge side and let the flower bed go wild as monbretia will grow through anything. It will look natural and I just can't keep the weeds out because they are all thick through the hedge. I hate spraying poisons because you never know if you killing cats, birds etc.